Twice a day, we milk all of our does who are currently producing milk, who we affectionately refer to as “the milkers”. As of today, we are milking 53 does, however that number fluctuates depending on how many does have recently given birth. Typicallly we try to have each one of our milkiers milk for 305 days and then give them 60 days off before starting again. Two people are on a milking shift at a time, and although the actual milking process is done together simultaneously, the pre- and post-milking tasks are separated into “first lines”and “second lines”. Before milking, everything is sanitized. After milking, the entire parlor and all of our milking equipment is cleaned, and then we process our milk. As a grade-A raw dairy farm, we take our milking process very seriously here at Left Foot Farm. With that in mind, it gives us great pleasure to share the process with you. First lines is all about sanitizing. Before we milk, we sanitize all of the equipment that we will use. In order to prepare for first lines, before doing anything else we wash our hands and put on latex gloves. Then we put on a smock and rubber gloves over our latex gloves and wash our hands again. Next, we enter the clean room, where we start to sanitize. Victoria puts rubber gloves on over her latex gloves. First, we plug and fill two sinks with water, adding half an ounce of bleach to each sink and testing the PPM with strips. Bleach is great because it sanitizes on contact, however we still scrub everything to be sure that all of our milking equipment is as clean as possible. After filling the sinks, we scrub the milking hoses and claws in the main sink with a brush, and then place the claws into the CIP sink and attach the hoses to the CIP machine, then run them through the machine for five minutes. (CIP stands for cleaning-in-place and is a method of cleaning hoses, pipes, etc. without disassembly, with the use of a machine that pulls water and cleansing solution through the tubes.) While the CIP machine is running, we scrub the milking buckets, gaskets, and lids in the main sink. After everything has been thoroughly sanitized, it is all hung to dry for another five minutes, and the sinks are drained. Once everything is dry, filters are put into the milking hoses and everything is assembled. Victoria adds half of an ounce of bleach into a bucket that is simultaneously filling with water, to be poured into the CIP sink. Victoria prepares to run the milking hoses through the CIP machine. Victoria scrubs the milking buckets in the bleach-water solution while the CIP machine runs. While first lines is being done, the person who is working second lines will be setting up the milking parlor with all of the essentials to the milking process, such as the milking towels and strip cups. Once the person doing first lines has finished with everything in the clean room, They bring both of the assembled milking buckets out into the milking parlor and place them into larger buckets that are filled with ice. Next, we will turn on the machines that we use to milk and adjust the pressure of the air line. Milking buckets, hand-dip cups, and milking towels are prepared for a great milking session! All of these steps take about 30 minutes, and after they are all completed, we are ready to milk! When we milk, we bring in six does at a time. Almost all of them will be waiting to come in at the door that leads from the barn into the milking parlor, and they will hurriedly run up and onto the stanchions, which have feeders hanging from them that encourage the does to bow their heads down, temporarily securing them in the stanchion. Each feeder is filled with a cup of organic grain, which keeps the does happy and occupied during the milking process. They only get grain during milking so this is extra incentive to behave on the milking stand. Their names are then marked off of a list, so that we are easily able to remember who has already been milked. Just a few of our does, not-so-patiently waiting at the door to be milked. Storm Warning is happy to get grain! All of the milkers names are listed on our whiteboard in the milking parlor, then are marked off when they are milked. Two does are milked at a time, one by each of the people working the milking shift. For each doe, we first dip our hands in a sanitizing solution, then we dry our hands with a clean towel, which is then tossed away into the “dirty towels” bin. Next, we strip the goat, which means that we hand milk each teat once or twice into a “strip cup”. We then spend at least 30 seconds cleaning their udder with another sanitary solution, and then dry them with a clean towel. A clam is then attached to each teat, and we allow the milk to be pumped from the udder and directly into the milking bucket. When the flow of the milk becomes very light, we massage the udder of the doe, which enhances the flow of the milk and assists with emptying the udder. Once there is no more milk flowing through the hoses, both clamps are detached and both teats are sprayed with Fight Bac, which assists in fighting any bacteria that could otherwise develop on the teats post-milking. This process is shortened to “dip, dry,strip, wet rub, dry rub, and spray,” and the process is repeated with each milking doe. After all six does on the stanchion have been milked, we release them from the stanchions and send them out the back door of the milking parlor and into their pasture again before letting the next six does in. Once the milking parlor is empty of goats, we repeat the entire process again, starting with letting in a new set of six does. Half way through the milking process, we turn off all of the machines and one person will throw away their latex gloves, wash their hands, put on a new pair of gloves, and put on a smock. Then, as quickly as possible, they will switch the lids of the milking buckets, so that the other half of the milk that is acquired during the shift flows into the second bucket. The machines are then turned back on, and the process continues. Once all the does have been milked, the machines are all turned off. Again, one of the two people changes their gloves and washes their hands, puts on a new pair of gloves and a smock, and secures a new lid to the milking bucket that had the milking lid. Each of the two people carry a milking bucket, now very heavy, to the processing room, where the person on first lines gets smocked up in a smock, a hairnet, crocs, and latex gloves after washing their hands, and they will put both of the milk buckets into the glycol that is inside of the processing room to chill. Before leaving the processing room, they write down their name, the date, and the time that the milking session was completed. The milk temperature needs to be down below 40 degres in two hours; our goal is to have the temperature down to and maintained at 36 degres within that time period. After dropping off the milk in the processing room, the person who is doing second lines will return to the milking parlor to clean all of the materials that will be used for the next milking shift. These include two new milking buckets, the lids for the buckets, the milking claws and the tubes that are used during the milking process. After washing their hands, putting on latex gloves, putting on a smock and rubber gloves over the latex gloves, then washing their hands again with the gloves on, the person on second lines will enter the clean room, where everything will be cleaned. First, the milking hoses are strained using a vacuum-like suction to remove any leftover milk from them. They are then scrubbed in the main sink using a special CIP soap, and then attached to the CIP machine with the claws placed into the CIP sink, where they are cleaned using the CIP soap and CIP machine for 6 minutes. While the CIP machine is running, the main sink is filled with water and foaming soap, in which the buckets and lids are scrubbed and then rinsed before being hung to dry. Kerri scrubs the milking buckets with foaming soap during the second lines cleaning process. Once the CIP machine has been run for six minutes, the CIP sink is drained and then filled again, this time only with warm water, and the machine is run again with the hoses still attached for another six minutes. Once that has completed, the hoses are hung to dry, all of the sinks are scrubbed with the leftover foaming soap bubbles, then rinsed, and the person who is doing second lines returns to the processing room. While second lines is cleaning the equipment, first lines is cleaning the milking parlor. To start this process, all of the stanchions are scrubbed with a brush to remove any dirt or goat hair that the does have left behind. Next, the floors are thoroughly swept, and then mopped with a solution of water and DZ-7. Lastly, everything in the milking parlor that has been touched is wiped down with the DZ-7/water solution. Before returning to the processing room, the person who is on first lines will fill all of the does’ waters that are in the barn. Libby dry-scrubs the stanchions after her milking shift. After cleaning the milking equipment and parlor, both people on the milking shift will meet again in the processing room. As always, before entering, they both must get completely smocked up in a hairnet, crocs, and a smock, then immediately wash their hands upon entering the processing room before putting on latex gloves. The temperatures of the milk in the glycol are checked, and if they have not yet reached a minimum of 37 degrees, they remain in the glycol and are checked again later. (In order for us to be able to sell the milk, it mush reach the appropriate temperature within a two hour period.) Once the milk reaches an appropriate temperature, the time and temperature is recorded in a log. The milk temperature log hangs in the processing room next to our glycol. When we arrive in the processing room, there are sanitized Left Foot Farm jars and caps waiting for us, as well as two buckets of milk from the previous milking shift which are in the refrigerator. We take the temperatures of the milk from the previous shift and log them, then pour it directly from the milking bucket into the Left Foot Farm jars, with the assistance of a sanitized funnel. Then, we cap the jars, and they are ready to be sold in our Farm Store or during the farmer’s market deliveries. In addition to the temperatures, we also log how much milk we have processed during the shift. Kerri pours milk into the cleaned and sanitized Left Foot Farm jars! A new round of Left Foot Farm jars come fresh from the dishwasher, which was loaded during the previous shift, and they are sanitized in one of the sinks with a solution of water and bleach, and then are set upside-down on a rack to dry. We are sure to leave a minimum of 8-10 of our sanitized half gallon jars for the following shift to use when pouring, as well as the equivalent number of lids to jars, and a funnel. We then rinse out jars that have been returned to us as well as any new jars that we need to add to the circulation, and place them all in the dishwasher with the funnel that we just used to pour the milk, and we run the dishwasher in preparation for the next shift. We mix a small amount of bleach in with a sink full of water to sanitize the Left Foot Farm bottles, which are then used to bottle milk during the next milking/processing session. Before leaving the processing room, everything that we touch needs to be sanitized with a DZ-7 solution. This includes the glycol lid and handle, the counter tops, light switches, door knobs, faucets and sinks, etc. The milk is then brought to the refrigerator that is located in the Farm Store, where it is beautifully displayed. 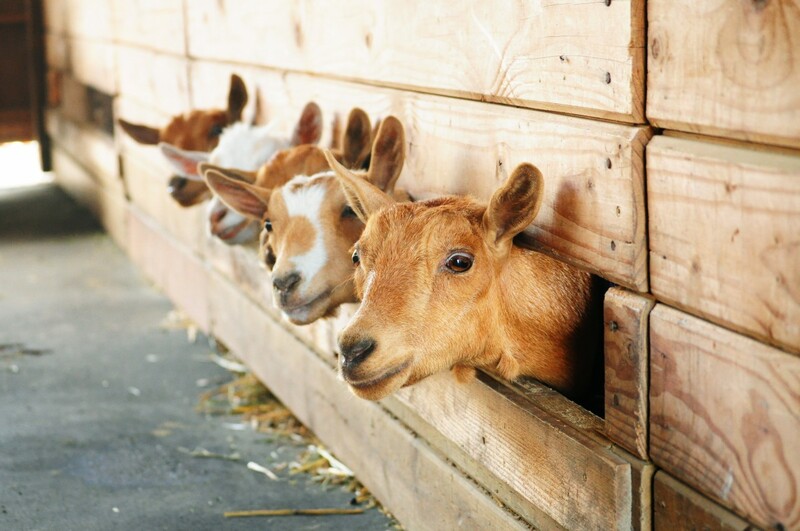 Fresh grade-A raw goat’s milk, waiting for you in the farm store!